Reuse old cans and be environmentally friendly. 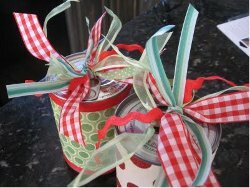 Create the cutest Christmas goodie pop top can. This craft is great for your friends and family. Everyone loves getting a little gift filled with all kinds of fun. You will surely be popping out smiles this holiday season with these Christmas crafts. Fill your cans with anything imaginable. The tiniest of stocking stuffers will be glad to finally have a home where they will not be forgotten about at the toe of the sock. Take any can that comes with a Pop Top. Remove its label and flip it upside down! Open the BOTTOM with a can opener! Leave the lid attached just a tiny bite. This will make a future step a little easier! Save the contents of the can for later. Wash out the can and dry it well! Add your fun surprise inside! Candy, gift cards and small gifts like jewelry fit perfectly! Add a small Holiday greeting inside as well. 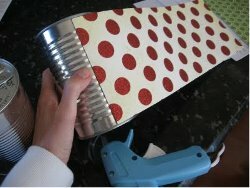 Bend the lid back down and use a hot glue gun and glue the lid shut! 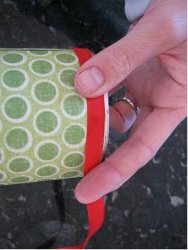 Measure and cut pieces of Scrapbook paper to re-cover the outside of the cans. Glue your paper on with your hot glue! Embellish your can if you'd like! Ribbon, Ric Rac, gems and button all add fun detail! Tie on fun coordinating Ribbon to the Pop Top tab! Be sure to burn the edges of the ribbon with a lighter to keep them from fraying! 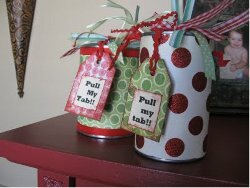 Add a tag that reads "Pull my Tab!" on top. And off you go delivering smiles and Holiday Cheer! For a couple years now, I have been saving oatmeal, breadcrumb and chips type containers that some with a plastic lid, and covering the outside in the same way using wallpaper or wrapping paper scraps or even fabric with holiday themes, and putting in cookies for gifts. But this idea takes it one step further with the pull tab top surprise element. However, make sure to assist if this is for a child as those tops can be sharp! Creative idea! I am stealing this idea for this Christmas when my family are all together. I was searching for something new and exciting, something that would get family involved. This is it! Honestly, I have never heard of such a thing before. A white elephant idea for use of these cans is to put a pair of "ugly" Christmas socks rolled up on the inside. fill it with candies and Hot Wheels cars for little boys. The possibities are endless. I love this idea for gift packages for my friends. I can see putting candles in these, little candies, and all kinds of trinkets to make them special and personalize them for each person. I would not recommend giving them to kids because I have seen a few nasty cuts from children opening the pop tops, but for adults, these make excellent items, and you can use scrap materials saving you a ton of money on embellishments. Plus, you get to recycle your cans. So cute! Looks so fun and something I could do with little cost for my sixteen grandchildren for Christmas! Good idea and one I might try. For children though I would use crisp tunes, (pringles, etc.) as these are easier to adapt, and safer. 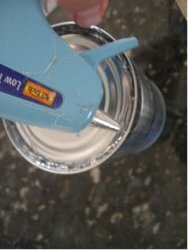 What is the purpose of cutting the bottom off the can? It doesn't say what you do after you cut it off. This idea is awesome. If you plan ahead then you could just save your cans. This is a great idea. Used last Christmas. One problem, not all pop top cans can be opened at the bottom with a can opener. Newer type cans won't work (rounded bottoms). I found some soup cans work. This looks like a great idea, but you never say how in the world you get the pull tab to work a second time??????????? From looking at it it looks like they opened it from the bottom the first time and hot glued it back on. So when the gift receiver got it they could use the pop top. My mind is already spinning thinking of all the things I can stuff inside these cans. I've knitted several pairs of socks for my family this Christmas. I can't wait to roll them up and "can" them. I'm also thinking that instead of wrapping paper or scrapbook paper I can print my own designs, pictures, etc. on card stock and apply. Or, how about using your child's drawing, or in my case grandchild's, to cover the can. As I said, my mind is spinning with ideas. I just tried this unque idea, and I love it! I used the idea for a birthday present, and it consumed about no time at all! I love how it's enviorment friendly! I do have some Pointers to make it even better: *read all the comments before you plan out your design *wash the can out and make sure it smells good before you put the stuff in the can(you don't want your BFF opening the can with excitement and it smells like Green beans!) *I covered up the top and the bottom just to cover up the directions on the top, and it looked good! I also cut an opening for the "pop top Part". I love this Idea and I hope you find my pointers helpful!!! what a way to think outside of the box! This is so neat!! Here I've been wondering why so many soups, etc. come in pull tab top cans now and thought it was a waste. Kudos to the genius behind this. Makes me want to go get my freezer containers together and open all those soup cans so I have 'materials' for a last minute project! This is perfect for a little gift Valentine's Day, etc. for family and friends. This is a great award idea for scouts. I love it! This is a cute idea. I could use this for my grandchildren, or my sewing club. 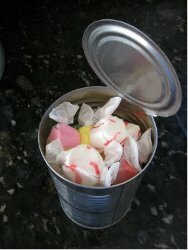 I use the can opener that does not leave sharp edges, that way the kids can help make these. This is a wonderful idea! It's simple to do but with oh so many possibilities. WOW is all I can say! Thanks!